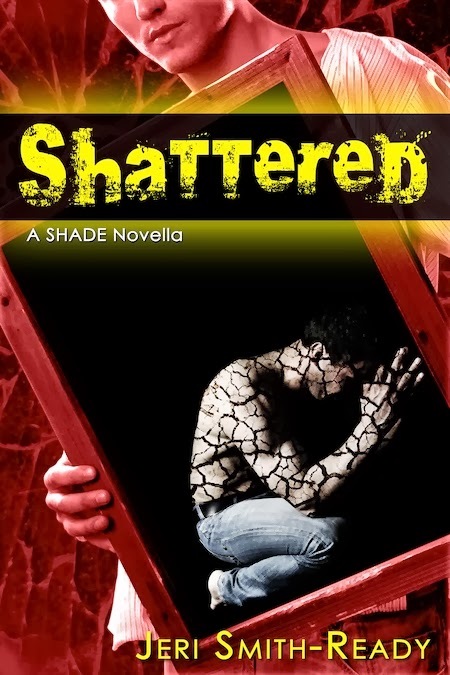 Those who were online December 21 (instead of out doing last-minute holiday shopping) might remember that I published the final installment of the Shade series, a novella called “Shattered,” on my website as a free download. This story from Zachary’s point of view was originally promised to readers as a reward for voting him into the finals of the 2011 YA Summer Crushin’ Tournament. Since "Shattered" was released right before Christmas, I didn’t do much promotion of it when it came out. Everyone was taking a well-deserved vacation from the internet, and besides, I had serious holiday shopping to do! So I planned a big promo week some time in January, when I'd release the illustrated PDF version, the playlist, and deleted scenes. All of those things are finally coming in the next week, but I've spent this month procrastinating the promotion of this novella I'm so proud of. All month I wondered, why don't I want to talk about “Shattered”? Is it because I don’t want to relive the intense strain of its creation (spending weeks in the head of a PTSD sufferer can make one a wee bit unbalanced)? Am I so eager to move on to new things in a new year that I’m loathe to take one last look back? I couldn’t figure out what my problem was. That’s when I realized why I put off talking about “Shattered”: it means saying goodbye. Goodbye to this series that brought me into the wonderful world of YA literature, where I feel more at home than any place I’ve ever been. Goodbye to the characters who made me laugh and cry and ponder big questions of life and death. Goodbye to the readers who astounded me with their enthusiasm, support, and generosity of spirit again and again. I know it’s not really goodbye, either to the YA world or to readers. I have another YA book, This Side of Salvation, coming out in (YIKES!) two months. I think it’s the best novel I’ve ever written. I’m sure it’ll have plenty of fans, in both my current readers and new ones. I've got lots more stories and novels in the works, so it's not like I'm disappearing. But Team Kilt was a once-in-a-lifetime phenomenon. The community we shared went way beyond the Shade books and characters. We did a Secret Santa exchange two years in a row. We had countless Mad Libs parties and SHADEboys chats on Twitter. We even had a movie night, where we watched (and mocked, a little) a Hallmark holiday film featuring Sean Faris, the actor/model widely accepted as the perfect Zachary (though a certain Team Kilter is still holding out for Matthew Lewis). I know that the friendships I made—that we all made—will live on long after the Shade series. I see it every day on Twitter and Facebook: Team Kilt members chatting among themselves, not just about books, but about their lives. Commiserating over bad days at work, or lending a shoulder to cry on during tough times with their families or health. To me, this is the greatest reward an author can have: not money or fame or accolades, but a community of readers who care about one another. My books set into motion something that made people’s lives better. I made “tiny changes to Earth,” as the song goes, in ways I could never have imagined. Then I go on to explain that Team Kilt is so much more than a fan base. They may have originally come together because of my books, but the magic is all theirs. It’s in each and every one of them, and it stretches around the globe, from Minneapolis to Melbourne, from Philadelphia to the Philippines. So while I’m still sad to say goodbye to the Shade series, I know that Team Kilt lives on. I have no doubt that in five years, ten years, twenty-five years, we’ll still be reuniting at RT Conventions to reminisce about the plaid tsunami that swept the lowest-seeded Zachary into the Crush Tourney finals—and swept Team Kilt into the internal Hall of Fawesome. And on those nights, not a single tear will be shed. PS: "Shattered"'s price of $0 does not in any way reflect its quality or its importance to me. I spent a total of about four full-time months writing, rewriting, and editing this novella (which, due to its length, is technically a short novel). Instead of asking for payment, I've included suggested charity links on the download page. BUT, if you really want to send some monetary appreciation my way, Kilt and Keeley are selling super cute, limited-edition trading cards for a price of your choosing. I appreciate whatever donation you can afford--truly, the total amount doesn't matter as much to me as the number of people who care enough to donate. I would be much happier with a hundred $5 donations than a single donation of $1,000 (please don't tell my husband I said that). PPS: If you’ve read and enjoyed "Shattered," please share it with others, especially those who might be comforted or inspired by Zachary's struggle and survival. They need your help, and so do I. And as always, thank you for reading. I mean it.